Rasmus Dahlin is in the middle of this media crowd as the likely top Sabres draft pick met the media in Buffalo at the NHL Scouting Combine. Back in mid-April, the Buffalo Sabres finished one of the worst seasons in their history. They finished last in the overall NHL standings, and played with a level of excitement that drew yawns instead of gasps from even the most devoted of their fans. If the NHL had used the structure favored by English soccer, no one would have complained if the Sabres had been relegated to the American Hockey League. Goodbye, Montreal Canadiens; hello, Bakersfield Condors. But those feelings of apathy out of Western New York were cured, at least for the moment, by the results of the draft lottery. The numbers came up properly for the Sabres, and they were “rewarded” for their season with their first draft choice. Buffalo did so in a year when the obvious first player in the draft was, at first glance, the best possible fit for the team – a potentially great defenseman. Finally, there’s a reason to feel good about the Sabres as they try to turn things around, again. Rasmus Dahlin is that reason. On Friday, he made his first appearance in Buffalo as a potential NHL professional and as a Sabre. Dahlin was here for the NHL Combine, which tests top prospects in a variety of ways and gives teams the chance to interview players that might consider selecting at the Entry Draft later this month. 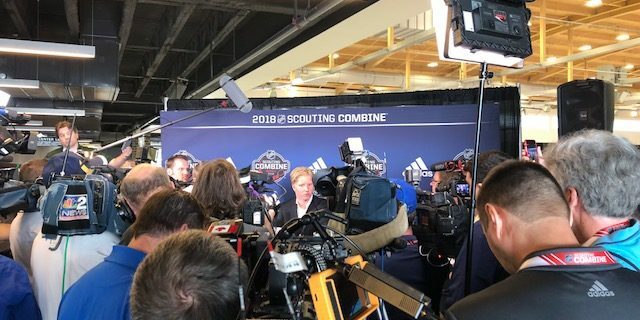 Such media scrums represent the most exciting part of Combine to outsiders, since it’s not exactly riveting to watch someone ride an exercise bike while wearing a mask. Dahlin’s interview appearance drew a big crowd of media types on Friday afternoon to HarborCenter. It wasn’t like 2015 when the Maple Leafs had the first overall pick, as every reporter in Ontario drove down the QEW to get Austin Matthews’ thoughts on anything and everything. Still, everyone was anxious to get a look at someone who might be spending the next 15 to 20 years in our fair city. Dahlin handled himself quite well under the circumstances. Remember, this is someone who only turned 18 in April and considers English a second language. It’s not easy to be under that sort of microscope, but Dahlin will have to get used to it in a hurry. The Swede wasn’t expected to make much news at this event, but he checked the usual boxes during a news conference that lasted about 10 minutes. Has he thought about playing in Buffalo since the lottery took place? How was the interview with the Sabres’ hockey department – which, by the way, did not include coach Phil Housley? “It was kind of similar to all the other meetings. They just want to know who I am and what I do off the ice, and that stuff,” he said. Maybe most importantly, there doesn’t seem to be much chance that Dahlin will stay in Sweden for an extra year or two. He wants to be in the NHL this fall. Dahlin will go through a full set of tests on Saturday, and then will head back to Sweden for a few weeks. But he’ll return to this side of the Atlantic for the Entry Draft, and that will raise the level of excitement and anticipation another notch. He’s already given the Sabres a faint pulse, and that’s a big first step for someone who hasn’t been fitted for a uniform yet. By fall, Dahlin will be asked to join with Jack Eichel and Casey Mittelstadt in giving the team a loud heartbeat. The hope is that they’ll make attending a Sabres’ game more fun than root canal surgery. Watch Rasmus Dahlin’s media appearance here on Buffalo Sports Page.